Art: A diverse range of human activities creating visual, auditory or performance artifacts expressing the artist’s imaginative or technical skill, intended to be appreciated for their beauty or emotional power. Activism: Efforts to promote, impede or direct social, political, economic or environmental reform or stasis with the desire to make improvements in society. Combine the two and you create a powerful force called art activism. Artist activists in league with conservation organizations are deploying this potent tool to change thinking about human impact on the environment in general and the oceans in particular. The goal is to raise awareness and change the environmentally damaging habits of individuals, communities, countries and cultures. Art activism is a relatively recent development and does not yet have its own Wikipedia definition. But it has roots in another form of activism — protest art. Also found under the Wiki protest art heading are definitions for political art and resistance art. Protest, political and resistance art have likely been around as long as humans have expressed opinions. One of the most famous examples of politically charged art is Pablo Picasso’s Guernica, completed in 1937, considered by many to be one of the most moving and powerful anti-war statements ever painted. In addition to opposing the Nazi movement, resistance, protest and political art have been used by activists to bring attention to and effect change during the American civil rights protests, the apartheid era in South Africa and the Vietnam War. Activist art also supports social and justice causes such feminism, labor issues and the equal rights movement. Studies show that art impacts our emotions more effectively than a gloom-and-doom news report. Let’s meet some of the conservation organizations and artist activists who are connecting people and communities to the ocean via emotion, attempting to change human behaviors, individually and collectively and save the oceans before it is too late. PangeaSeed formed its own vocabulary for the creative explosion that resulted from the marriage of art and environmental activism: ARTivism and ARTivists. At the PangeaSeed Foundation, formed in 2009 by Tre’ Packard in Tokyo, science and education are combined with art and activism. The mission is to empower individuals and communities to create meaningful environmental change for the oceans. Currently more than 300 international artists from 30 countries unite under the PangeaSeed banner to “take the ocean to the streets and give it a voice,” according to Packard. Packard founded PangeaSeed as a result of his travels throughout Asia witnessing and documenting how fisheries are contributing to the destruction of ocean ecosystem. He also exposed the illegal trade of threatened marine life. These experiences, coupled with his interest in contemporary art, led him to establish the PangeaSeed Foundation. Pangea, also spelled Pangaea, references the ancient Greek meaning, “entire earth,” referring to the super continent that was surrounded by a single vast ocean before the landmass was separated into now recognizable continent forms. “Seed” evokes an image of growth, progress and evolution — and also is the acronym for Sustainability, Education, Ecology, Design, the four core pillars of the foundation. At PangeaSeed, a picture is worth MORE than a thousand words. Through cutting edge videos, music and contemporary art murals, PangeaSeed reaches out to a younger, hipper generation. “The next generation is really in line to inherit the issues we leave behind,” says Packard. “I felt that conservation had a militant feel and that didn’t really register with younger people. I was also concerned that some things hadn’t changed in 20 years, like the dolphin slaughter in Japan. There was also a lot of scientific jargon. Shark finning was the first conservation awareness issue that PangeaSeed tackled, after Packard uncovered and documented a huge shark finning operation in northern Japan. A shark advocacy video, Sink or Swim, was screened as part of an art exhibition in Japan to raise awareness about the dangers of overfishing of sharks and the cruelty of finning them. Another PangeaSeed program, Sea Walls: Artists for the Ocean, brings the ocean into the streets around the world, with 300 murals painted in 12 countries since 2014. 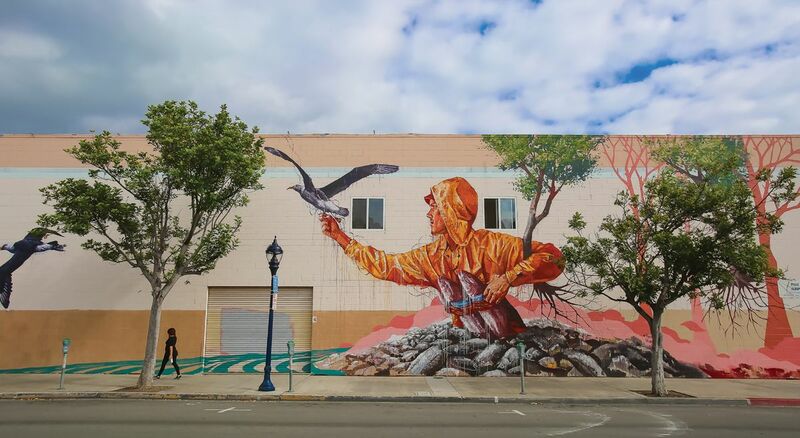 Packard acknowledges that Wyland and Guy Harvey paved the way as painters of public marine murals, raising awareness of ocean conservation issues. “We’re coming from a new angle and attracting a new generation. They have to be the future problem solvers,” he says. PangeaSeed is currently partnering with PADI to certify participating ARTivists as scuba divers, to help inform their art. Jacques-Yves Cousteau once famously said, “People protect what they love.” Wyland, the ocean muralist and environmentalist, began his lifelong love affair with the ocean after watching a Cousteau television special. “I was a kid in Michigan, dreaming all of the time of the ocean. Jacques-Yves Cousteau brought the ocean alive for me and for an entire generation. I wanted to be him. I loved the gear they wore, the films, the music. I learned to dive because of Cousteau,” Wyland recalls. At the age of 14, the ocean-dreaming youngster saw gray whales migrating offshore of Laguna Beach, California. The gentle giants went on to play an important role in Wyland’s prolific art career. He began his career as a marine muralist of life-sized whales in a project called the Whaling Walls. In 2008, 27 years after starting the campaign, Wyland succeeded in painting his 100th life-sized public marine mural. Wyland’s goal was to convey the urgency of conservation issues to the public. The Whaling Walls campaign is one of the largest public art projects in history, spanning five continents, 13 countries and 79 cities around the globe. He is also the founder of the Ocean Artists Society (OAS), using ocean art to inspire people around the world to a greater awareness of the need to preserve our natural world. OAS member-artists participate in public education programs around the globe about marine conservation, with an emphasis on reaching out to children. Launched in the summer of 2017, the Wyland World Water Pledge seeks to inspire the planet’s 7.5 billion people to use water sustainably. The Wyland Foundation partner in the project is the United Nations Environment Program. The 10-year outreach program is designed to “inspire and engage every person on earth about the sustainable use of the planet’s oceans, lakes, rivers, streams and wetlands,” according to a press release. Learn more about the Wyland World Water Pledge and make your pledge: wylandworldwaterpledge.com. 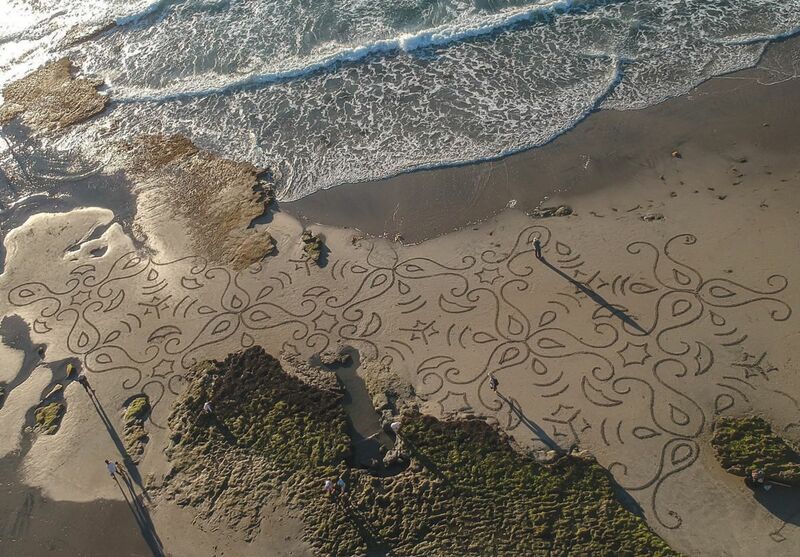 Aerial of Andres Amador’s beach art. Andres Amador is another artist who thinks on a grand scale. Rather than paper or even a wall, this artist uses an entire beach to create his art. “Nature is the dominant aspect of my artwork: it is the literal canvas,” says Amador. He’s been doing this work for more than 15 years now. The first years were spent in exploration, understanding the medium and developing the techniques of large-scale art; studying and practicing triangular grids and tessellation, says the artist. Tessellation is a pattern of shapes that fit together perfectly, like geometric tile work, a puzzle or even an intricate repeating wallpaper pattern. His wife Ember, also an artist, assists Amador in his work. Their young son, Kavi, has his own set of smaller tools and creates his own designs or helps fill in the big designs, with help from mom. The family is based in the San Francisco Bay Area. In addition to helping the viewer think about the nature around them, Amador seeks to play on the impermanence, not only of his art, but nature, too. Part of the experience for the viewer is to not only see or experience the creation of the artwork but to also see it altered or erased by the incoming sea. The landscape is as fragile and ethereal as the work of art. “These are questions that I hope to raise in the viewer,” says Amador. The artist calls his work soft activism, raising questions about nature and impermanence in the viewer. But Amador is also entering a new phase where his work will have a more direct impact, funded by a grant and working closely with a marine biologist who does coastal work. For more on Andres Amador and Elemental Arts, visit elementalteamarts.com. 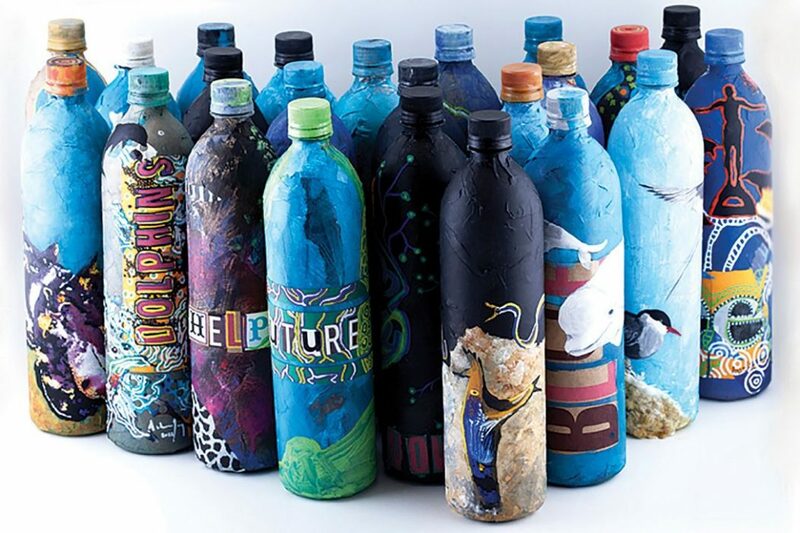 An oil spill, a song and a beach cleanup inspired the art activism of Asher Jay, perhaps best known to the public for her Message in a Bottle (MIAB) art installation, currently on display in Times Square, New York City, at the National Geographic Encounter. 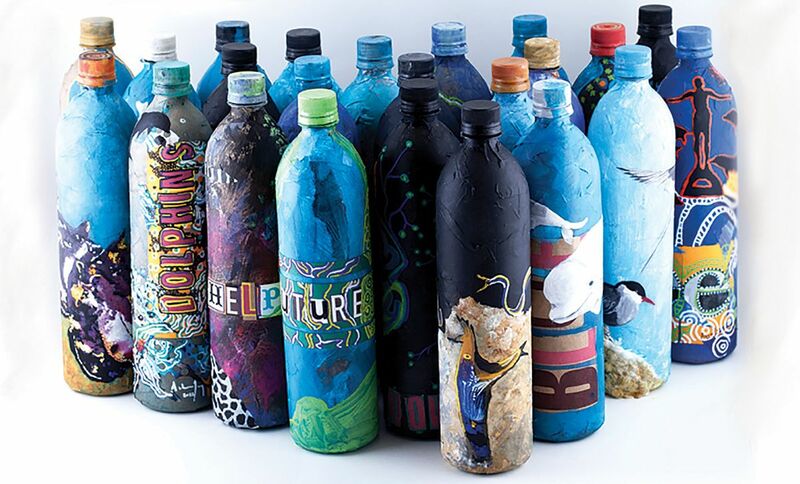 The MIAB platform is now being opened up for kids worldwide to contribute their own bottles to the installation. The top 365 bottles that get the most views and likes online will be installed in the Times Square exhibition at National Geographic. “I want our youth to realize they can make a lasting artifact out of a discarded refuse item, channel the cause that not only matters most to their heart and soul but has the most positive impact for the largest group of living beings on planet earth — both human and wild!” says Jay. More than 300 million tons of plastic is produced globally each year, with only about ten percent of that being recycled and reused. According to Jay, “Art and writing can breathe new life into a hackneyed narrative arc, while keeping the grey areas alive. The human mind has a way of separating situations and individuals into good and evil, vilifying those who commit a “wrong” and pitting them against the crusaders who fight the good fight, but more often than not, issues are more complicated than that. There are more variables to address and it is seldom a ‘one-off’ incident. Artist, designer and conservationist, Jay was named the 2012 United Nations Women Design Star and, in 2014, a National Geographic Emerging Explorer. She holds a Bachelors of Fine Arts from the Parsons School of Design. She is the creator of Garbagea, an online parody project where users interact with and experience the United Flotsam of Garbagea. National Geographic, the World Wildlife Federation, the American Museum of Natural History and many other educational and conservation organizations have featured her work. Michael Aw, the founder of ONE OceanNEnvironment, the Celebrate the Sea Festival, the Elysium Project and the Ocean Geographic Society and its publication, Ocean Geographic, uses an image of an iceberg to try and help people understand and visualize the problems oceans are facing. According to Aw, all of OceanNEnvironment’s projects are results-oriented and results-measurable. Honorary Fellows and Associates of OceanNEnvironment include award-winning underwater filmmakers, photographers, marine biologists, researchers and writers dedicated to producing high-quality natural history multi-media works. The organization’s key activity is the presentation of information about the natural environment in a visually exciting and thought-provoking manner to motivate people to learn, to love and to help preserve the ocean environment. “In the Elysium Project,” says Aw, “We are using art and photos to show and demonstrate what is going on, based on the collaboration between scientists and artists.” Artists and scientist travel together as part of a research expedition. The Elysium Project launched its third collaborative research expedition, called the Heart of the Golden Triangle, last fall. Two previous science-art collaborative expeditions were Artists in the Arctic in 2010 and the Shackleton Antarctic Visual Epic in 2015. Each team consists of 50 to 60 people: scientists, artists, musicians. “A diverse team of dedicated people,” says Aw, “two or three principal scientists/investigators and about 10 associate scientists helping with collection work and cataloging samples. Then there are photographers who document animal life on land and underwater and artists who paint. 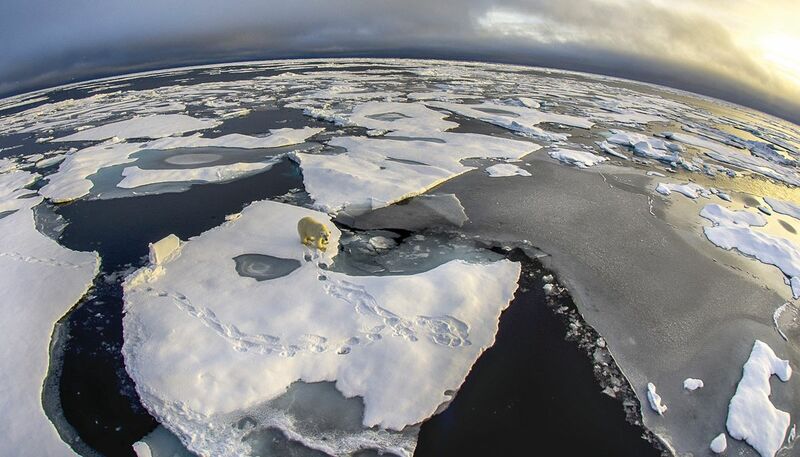 We are guided by the science.” Each expedition is about 20 days — planning takes about two years. The Coral Triangle is quite a departure from Arctic and Antarctic studies. “The reason we visited the Coral Triangle is because in terms of marine life it is the area richest in fish life and corals. What we want to learn is when does abnormal become normal? In the tropics, an abnormally warm water temperature of 87.8 degrees Fahrenheit (31 degrees Celsius) used to occur about once every 10 years — the last significant warming being in 1998. But now warming incidents occur more frequently, leaving less time for coral and fish to recover. On the Great Barrier Reef, every year the water is warmer. With no recovery time, what is there may be lost forever,” says Aw. ONE OceanNEnvironment, a registered charity with Environment Australia since 2008, operates throughout the Asia-Pacific region. The mission of OceanNEnvironment is not only to promote preservation but also to document the status of coral reefs, bio-diversity, and the impact of man-made pollution through research programs and educational expeditions. Of course, this is just a small sampling of what’s happening in the growing world of art activism. I know this for a fact, after going down countless creative “rabbit holes” on the Internet while researching this article. I suggest you have a snack before Googling, “ocean art activism” and start surfing the more than 37 million related links.